Another enticing match-up on the women’s side on Friday will see the number 23 seed, Victoria Azarenka go up against Kristina Mladenovic. The Frenchwoman has been in excellent form during the grass court season; she reached the quarter-finals of ‘s-Hertogenbosch and the semi-finals of Birmingham with four top 50 wins in the latter including a third set tiebreak victory over Simona Halep. 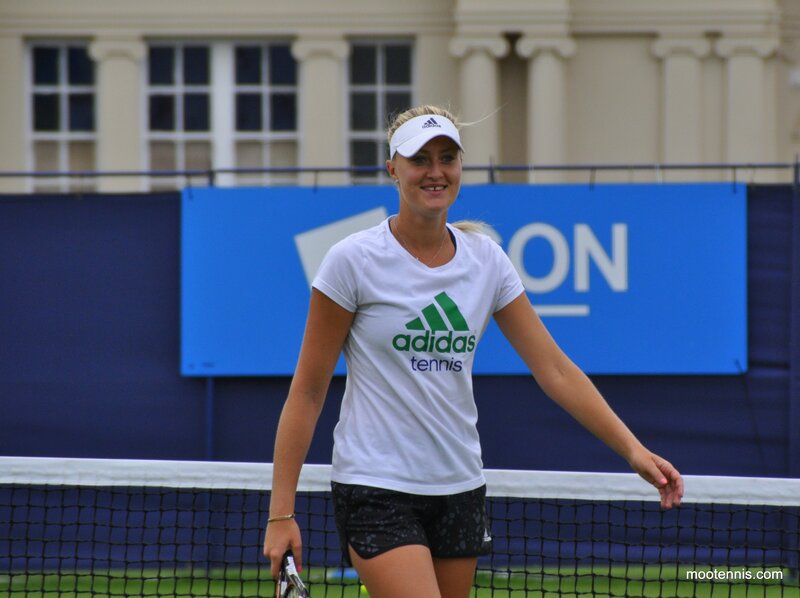 Mladenovic has begun her Wimbledon campaign with two straight set victories against Alexandra Dulgheru and Jelena Ostapenko. The match against last year’s juniors champion and conqueror of Carla Suarez Navarro in the first round looked to be a potential banana skin but Mladenovic held her nerve to come through, 6-4 7-5. Mladenovic was a break down in both sets and even had to fend off three set points in the second set. I don’t think Kiki was too impressed by the handshake after what she posted on Twitter! Azarenka’s grass court preparation didn’t exactly go to plan as she was forced to pull out of Birmingham after one match with a foot injury. It wasn’t confirmed but there were some suggestions that it could have been the same injury that derailed her 2014 season. There’s been no sign of any problems though in her first two matches with Azarenka storming through her opening two rounds, losing no more than three games in the four sets she has played against Anett Kontaveit and Kirsten Flipkens. Often forgotten, Azarenka is a two-time Wimbledon semi-finalist and has grass court pedigree. Azarenka and Mladenovic will be playing each other for the first time. I’m really on the fence with this one. I’m all in for Kiki at the moment and I think she has a real shot at winning this match. She’s played a lot of matches, many more than Vika on grass, and she has weapons that can hurt the Belarusian, notably the serve. The one worry for Mladenovic is that she does seem to lose concentration and her tactics can waver. It’s something that is improving but she will need to be on her A-game from start to finish against Vika. When I originally wrote this on Wednesday night I had Mladenovic as my winner. I’ve wavered because I think it will require an incredible performance from Mladenovic. I have a nagging doubt that she won’t be able to maintain her form for long enough to take out Vika. Ohhhhhh i’m sad this didn’t make No.1 Court where I am tomorrow. This is a superb match for the third round and the one thing that keeps ringing in my head is how Sloane Stephens is not a seed? Stephens has had a superb couple of months but it’s not been enough to counteract what was a miserable second half to 2014 where she is defending barely any points (Cincy R3 points best result) for the rest of the year. The American player has been winning matches you would expect her to win and pushing top ten players all the way. Stephens took out the number 27 seed, Barbora Strycova in the first round and backed it up with a straight sets win over Lauren Davis, 6-4 6-4. 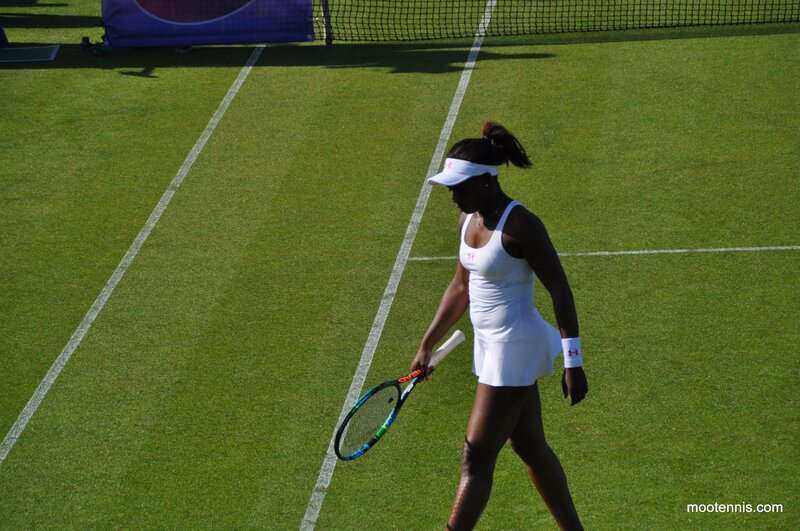 All of Sloane’s previous matches against Davis had gone the distance and she was 1-2 in the head-to-head. This was a good indicator of Sloane’s recent improvements. Safarova was on the brink of an early exit in the first round but she showed some grit to hang on, with a bit help from her opponent, defeating Alison Riske in three sets, 3-6 7-5 6-3. After that early scare Safarova breezed through her second round match, not facing any break points and securing a 6-2 6-3 victory over Su-Wei Hsieh. It was a pretty boring match but oh myyy, i’ll take boring for Lucie particularly with the prospect of this third round match. Poll Results: 90% of readers correctly predicted that Kerber would beat Pavlyuchenkova, 87% correctly predicted that Lisicki would beat McHale and 42% correctly predicted that Rybarikova would beat Makarova. July 2, 2015 in Azarenka, Mladenovic, Safarova, Stephens, WTA. As I said in the preview, I think the winner will be in two sets. If I went for Sloane it would have been in two sets. Don’t ask me why, that’s just what I felt. Sorry that you think it is biased but that is my honest opinion. I do agree with you. It won’t end in two sets like James hope to happen unless Stephen chokes. Again, two chokers play together, so we have to see who choke first. Sighh, as i’ve already said, I think the winner (Lucie or Sloane) will come through in straight sets. Also notice i’m using their names. It would be nice if you could show some respect and use their names too. This is a 50/50 chance match. I will gave the edge Sloane. Azaranka match also 50/50. The only time I see Azaranka played well is when she plays Serena. Agree. Vika and Lucie are not that impressive in the previous matches. Both matches are 50/50. On paper, it should be Vika and Lucie but I feel Vika’s match more likely to be an upset in making. Vika screaming and her on court attitude annoys me. She is always upset at her opponent and not herself. To be honest, Vika and Kristina MLA play similar type of tennis. They both can hit very hard and I feel Kristina has better service games than Vika. In addition, Kristina has improved her resistance and much patience on court nowadays. I think she can pull out an upset her. Similarly, Sloane Ranger has more patience and a little more calm lately (i.e. better coaching I guess). She has more varieties than Lucie. Obviously, she plays volleys better than Lucie and I see this will her game plans to dismantle Lucie. I think Sloane will go through. Perpahs Lucie can prove me wrong. Both matches will play in three sets. I see one or two upsets in making. I agree about Vika. I think she’s a nice girl but she comes across like a forever bratty teenager. If Stephen does not choke, she will beat Lucie. I was just saying that I will of course be rooting for Lucie (Always!) but that I was a bit scared for her match against Stephens. I personally don’t find Lucie fully comfortable on grass yet (at least not as much as she was on clay in Paris). She seems more hesitant to me. On the other hand, she has had a tough R1 and an easy R2 just like in Paris. And at the French Open, she started to elevate her game as from R3 and also handles her nerves much better. So I expect a tough match where everything is possible but I have faith that Lucie can come through if she goes more for her shots. She needs to play as aggressive as in Paris. I could definitely see Mladenovic winning this one. She’s just so positive and as soon as a players level drops, she starts hitting inspired shots. That could REALLY unsettle Vika. >>>Strange to see Vika getting low support to win….her recovery is not that good but she still can win in 3 sets, i don’t know which Mladenovic will turn on the court.Vika in 3 sets. >>>Krunic can play a spoisport and Venus will find it tough to manage court against her.Upset for me. BMS choked again. Led 5-2 in the first set and lost. Sloane choked too but three sets as expected. Kiki and Vika match was very close though they play in two sets. Coco is expected to beat Stosur. It is a bad match up. Venus is too powerful for Krunic. I have to say Belinda pulled off a great escape that first set. That medical time out, a bit suss. Although legal it messed Beth up. I see James taking pictures of her playing mixed doubles afterwards. Her movement seemed hampered against BMS. I guess she is alright then. Anyway, Victoria Azarenka awaits her next. Has to be the ‘match of the round’ so far at Wimbledon,Serena digs deep to defeat Watson in 3 sets,high quality match,…Serena survives to play her sister Venus on Monday.Big shout out to Watson! A great performance from Heather, she gave an incredible account of herself. Hats off to her!